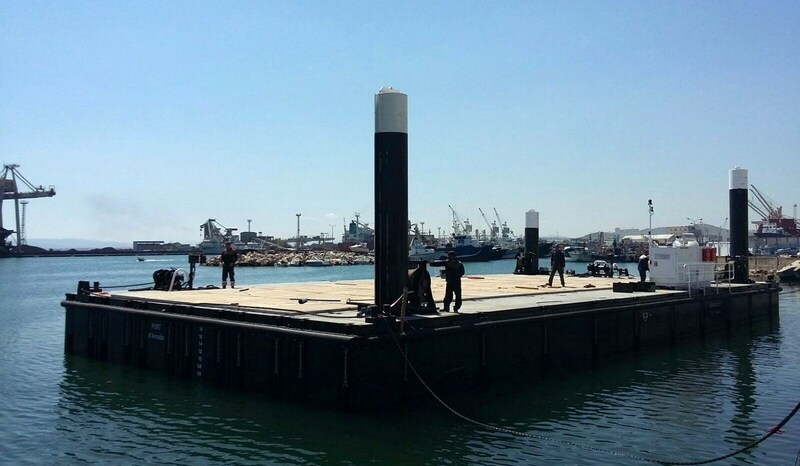 The Damen Modular Barge (DMB) is a container-sized floating unit that forms a versatile building block for all sorts of modular pontoons and vessels. 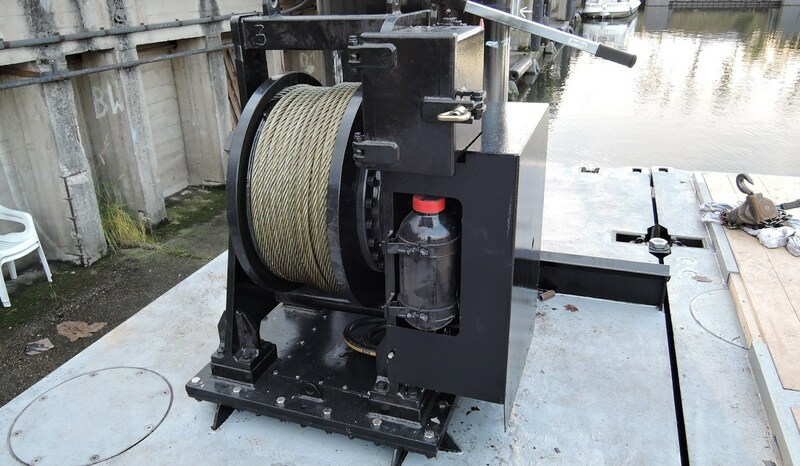 The barge can have many configurations, and can be fitted with a huge range of equipment. 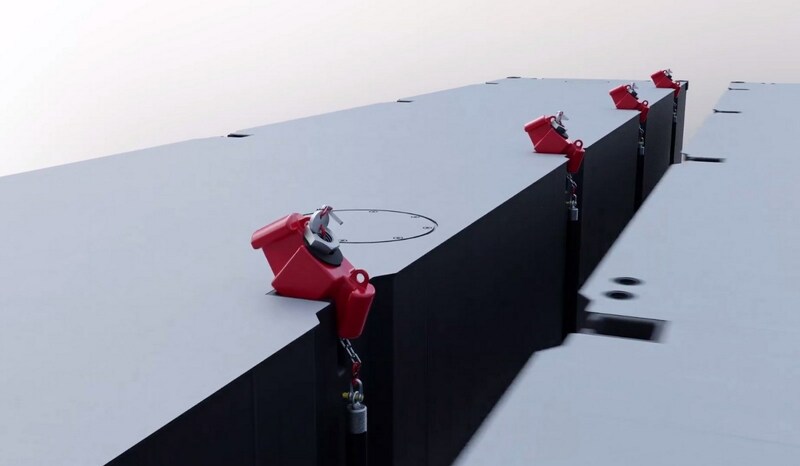 Multiple DMBs are coupled together by the unique class-approved Damen Link (two hooks, a connection rod, a washer, nut and securing plate) to form a professional marine vessel with standard Damen quality. 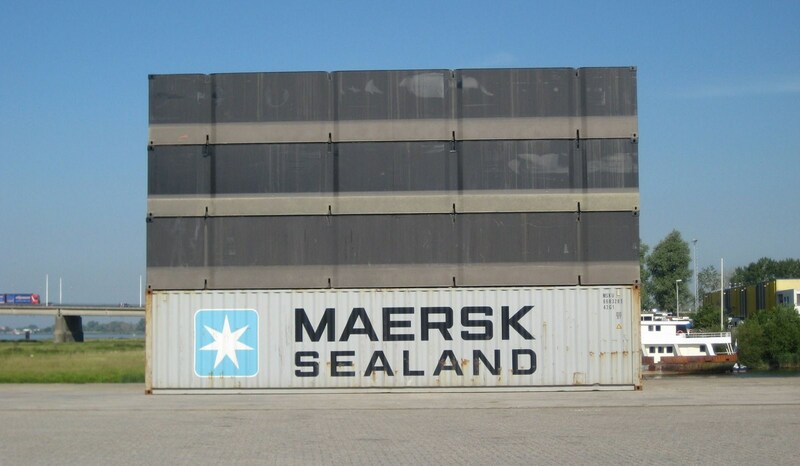 The DMBs can be stacked as standard containers and transported by truck, boat, plane and train. 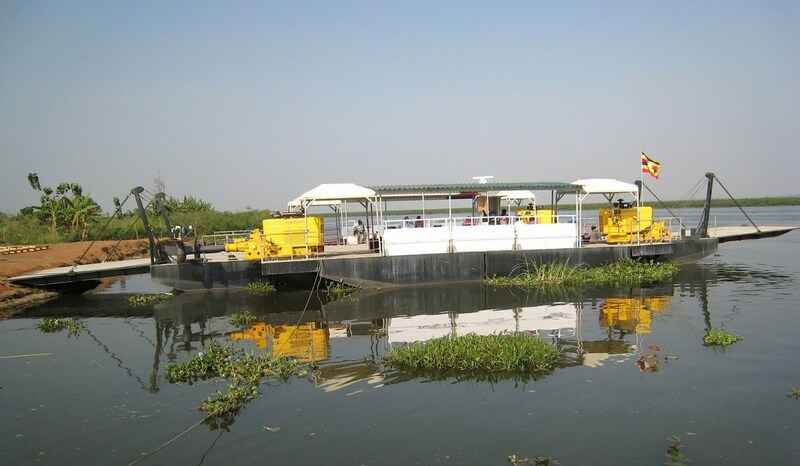 They operate in coastal waters, inland waterways and lakes anywhere in the world – including landlocked waterways. 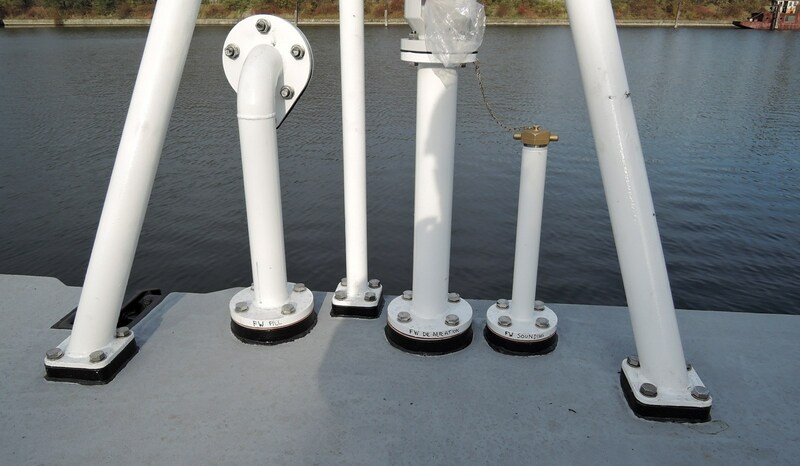 A wide range of uses includes lifting, dredging and piling. 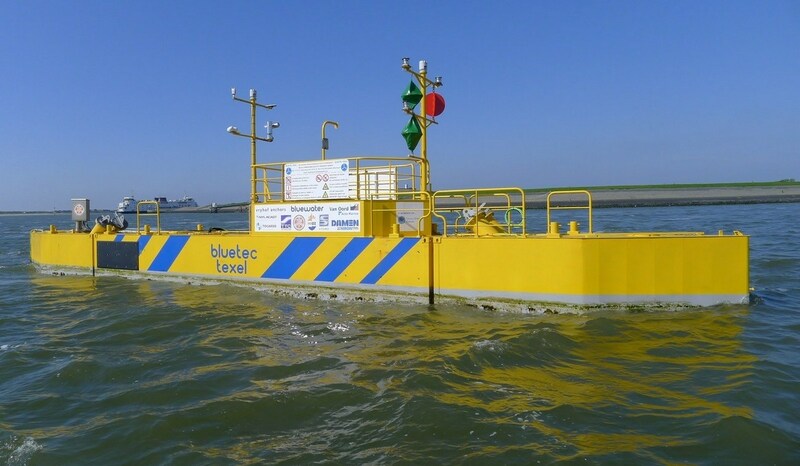 They can be fitted as accommodation blocks and wheelhouses and are even in operation as ferries, and as pontoons for generating electricity from the tides. There are a series of 20- and 40-foot container size modules, and many options. 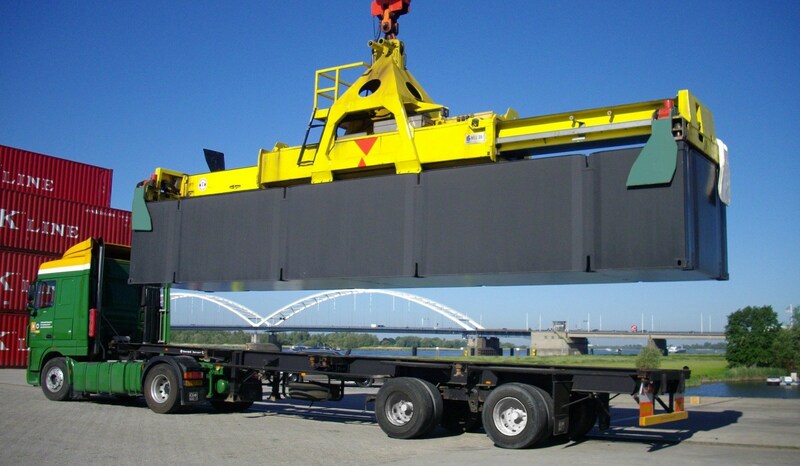 The Damen Modular Barges can easily be transported by truck. 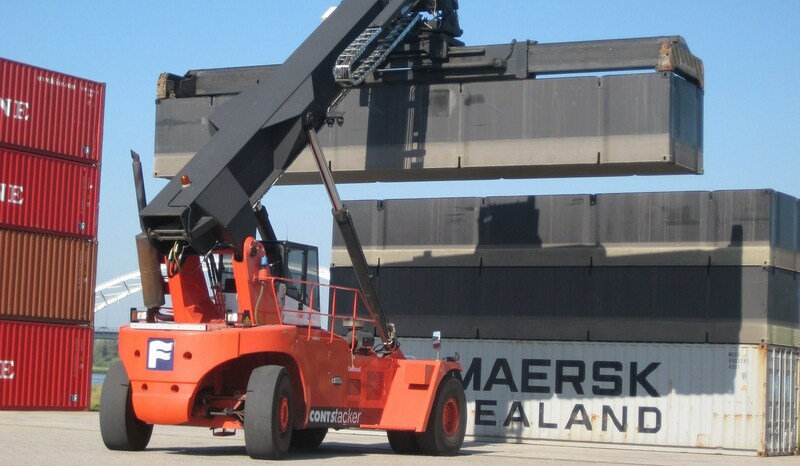 DMBs can be lifted by a standard container spreader. 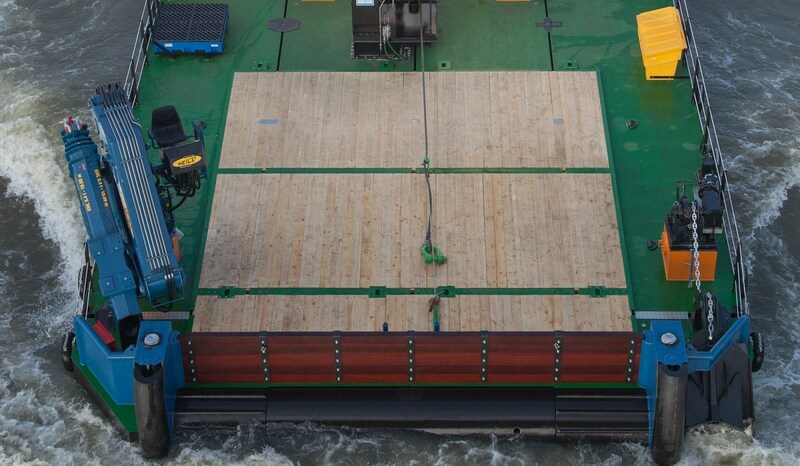 You can pick up Damen Modular Barges using any standard container handler. 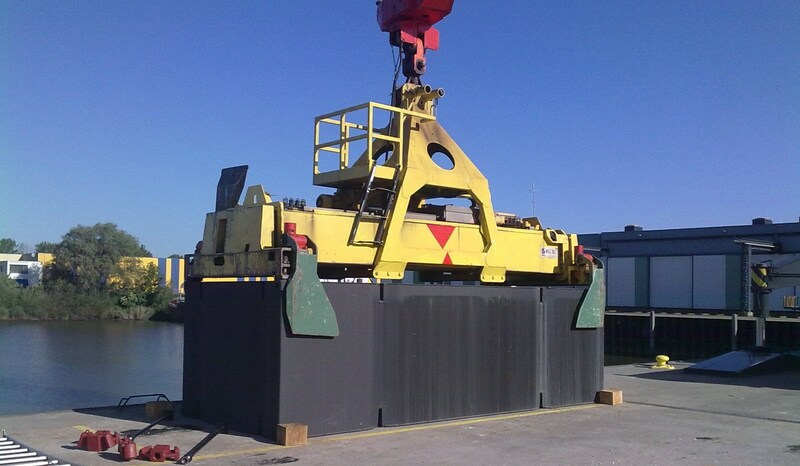 The Damen Modular Barges can be stacked as standard containers. 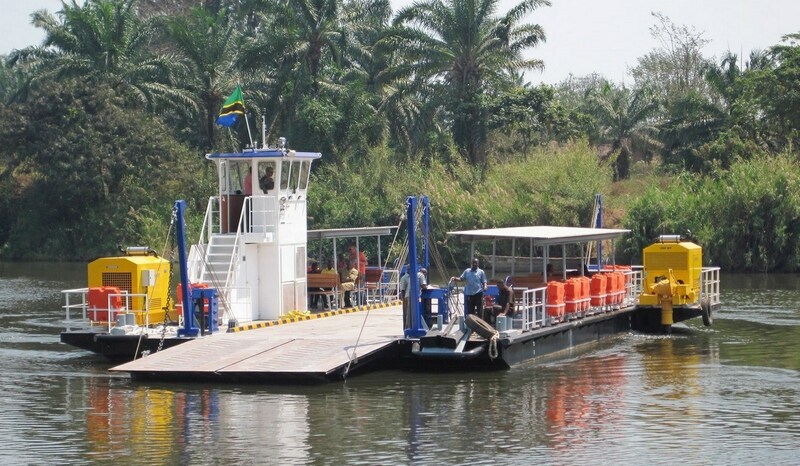 This fit-for-purpose ferry is in service on a river crossing in East-Africa. 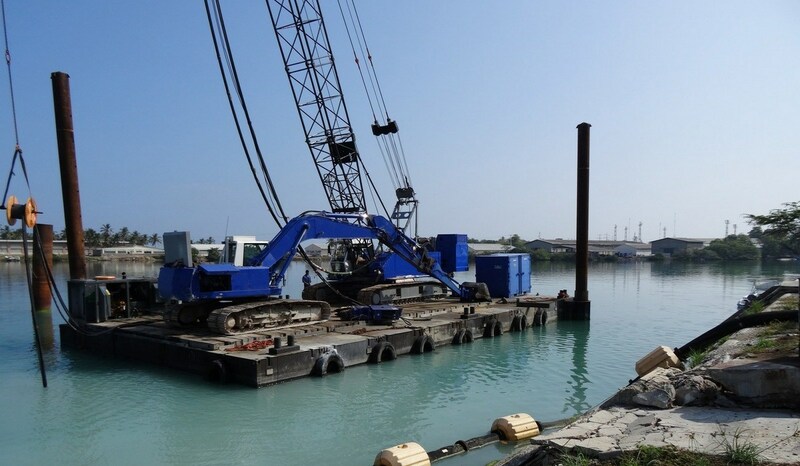 The Modular Multi Cat provides valuable dredger support and anchor handling capacity. The ferry has all necessary safety provisions. 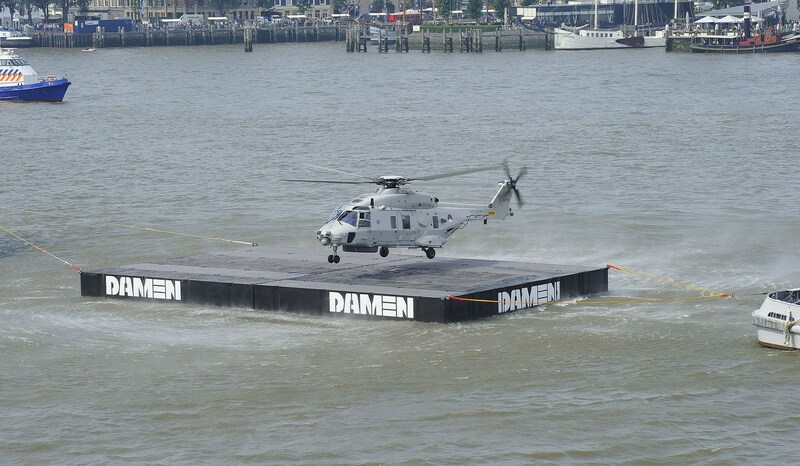 Damen Modular Barges are highly suitable for supporting all sorts of military actions. 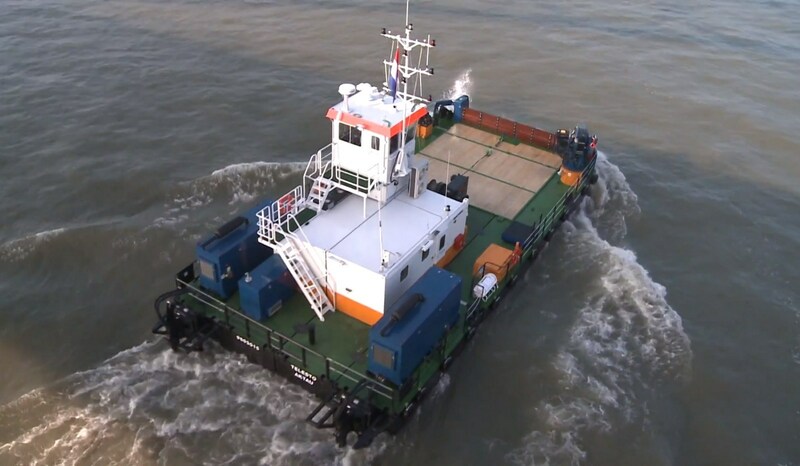 The Damen Modular Multi Cat can be equipped with crane, winch, bunker tanks, towing bit and push bow. 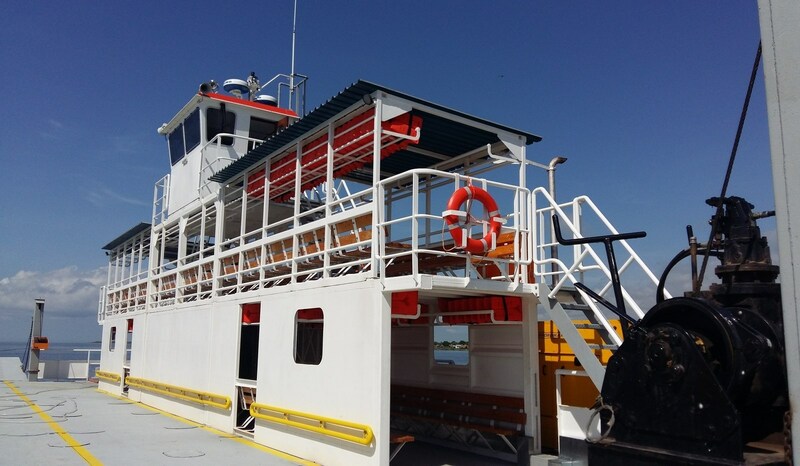 The Damen Modular Ferry has two heavy duty ramps especially designed for beaching. 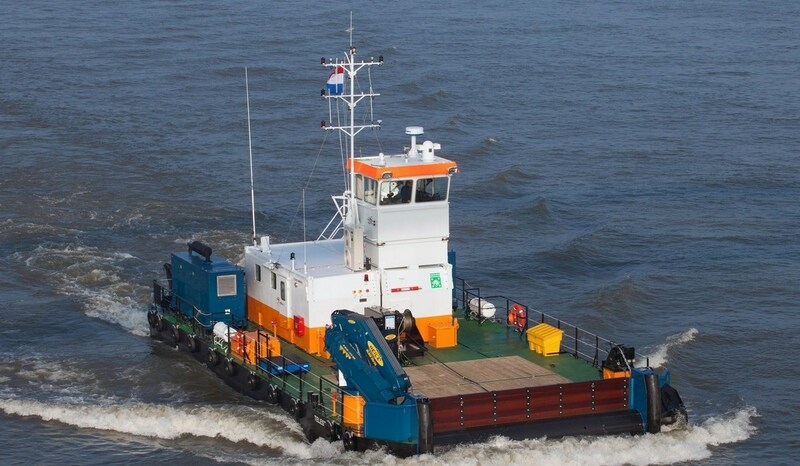 The Damen Modular Pusher is fully equipped for push-boat operations in inland waters. 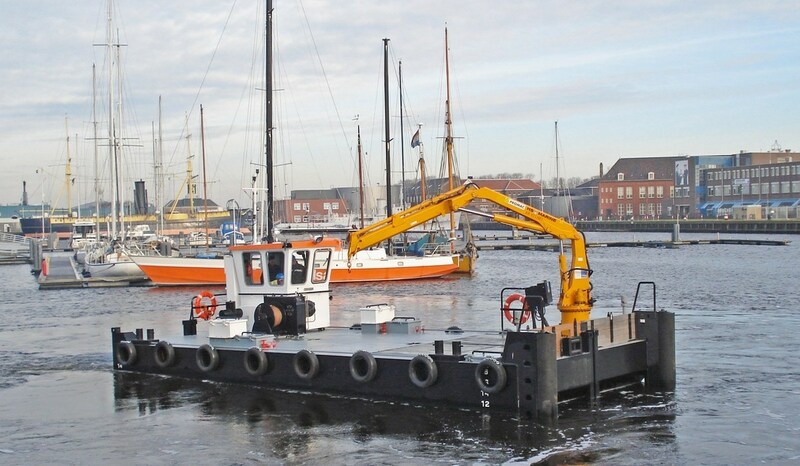 The heavy-duty Damen Modular Pontoon is highly suitable for lifting, dredging and piling operations. 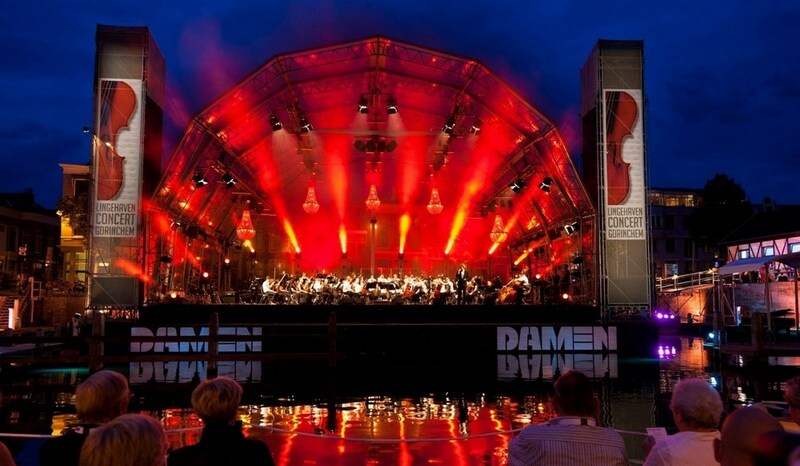 The Damen Modular Concert Pontoon can be assembled to suit any application. 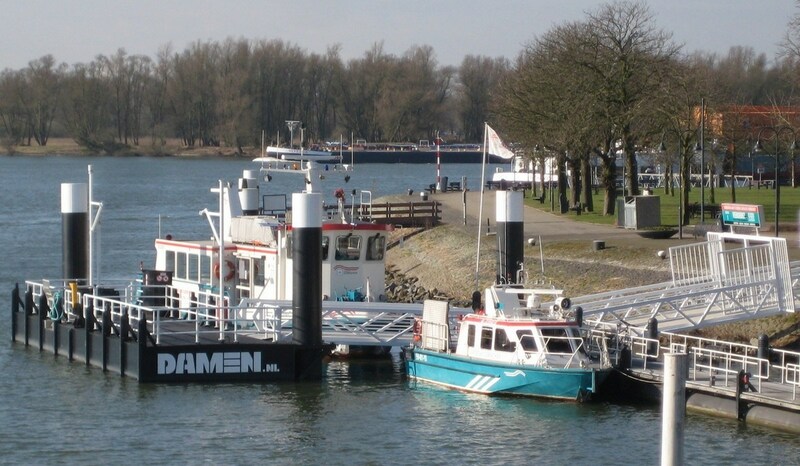 The Damen Modular Jetty is provided with access bridges, gangways and a dedicated bunker station. The Damen Modular Tidal Turbine is a pontoon for generating electricity from the tides. 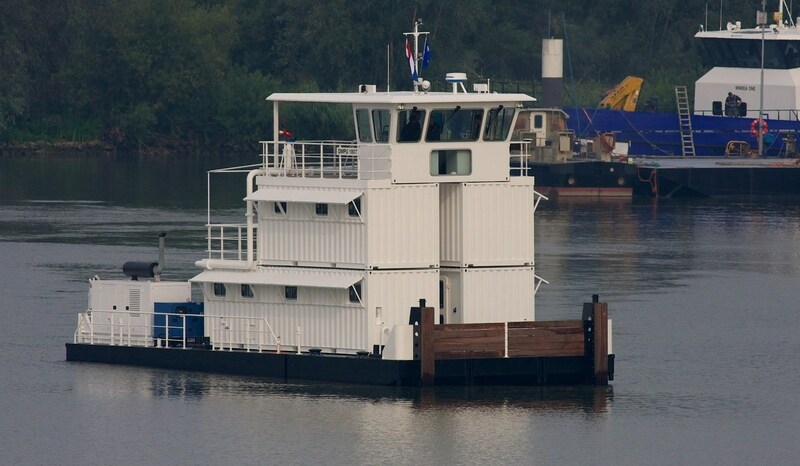 The Damen Modular Booster Pontoon has crew accommodation and a heavy duty booster pump for dredging operations. 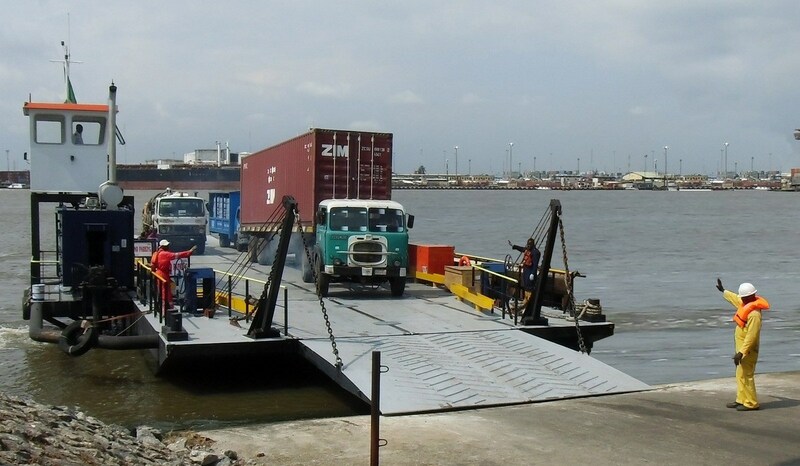 Modular jetties provide multi-purpose support for cargo vessels, such as berthing, fuelling, shore connection for electricity and serve as a store location. 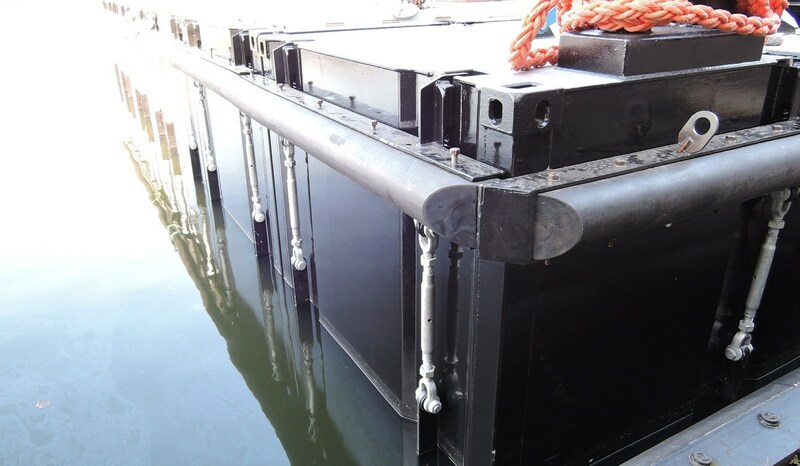 Damen Modular Pontoons and Vessels are incredibly versatile. 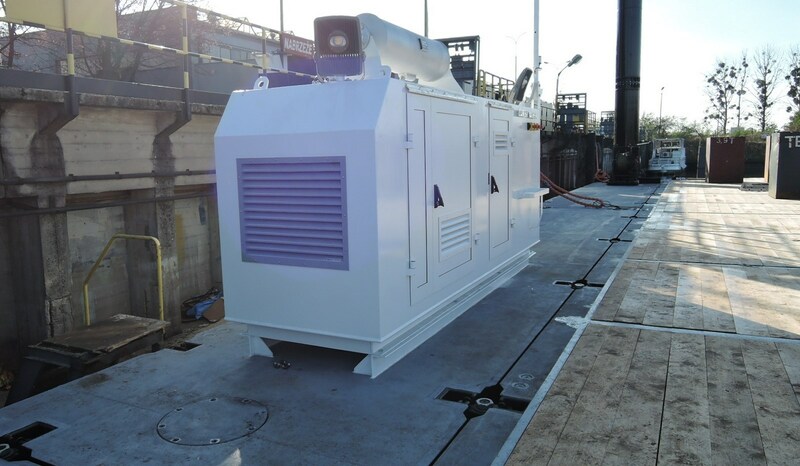 They can be fitted with bollards, towing brackets, fendering, generator sets, marine type filling, deaeration and sounding pipes. 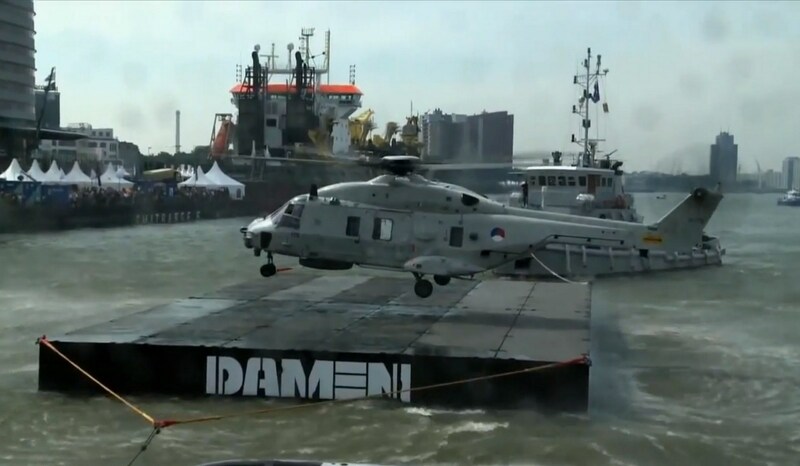 Damen can deliver bunker stations, and all kinds of heavy equipment including crawler cranes, excavators, crane mats, power packs, DOP pumps, hydraulic hammers, modular spud systems and heavy winches. You name it, we can fit it! The vessels (modular multi cats) can also have equipment like heavy duty bow rollers, wooden work deck and heavy duty marine cranes. 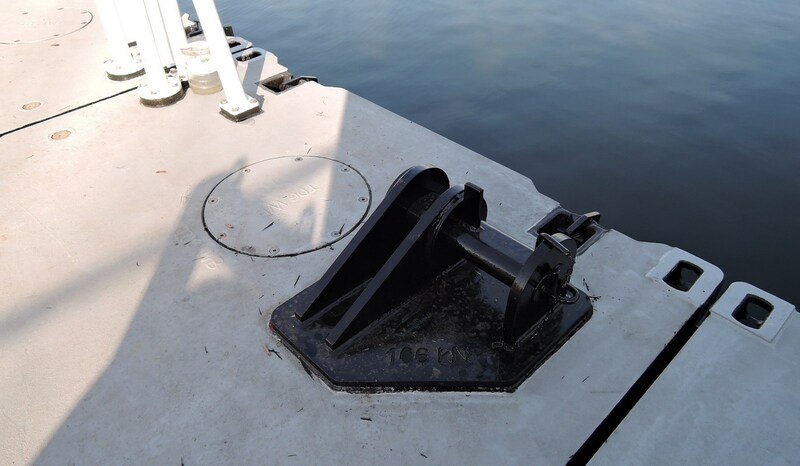 Deck mountable engines are easily accessible for maintenance. 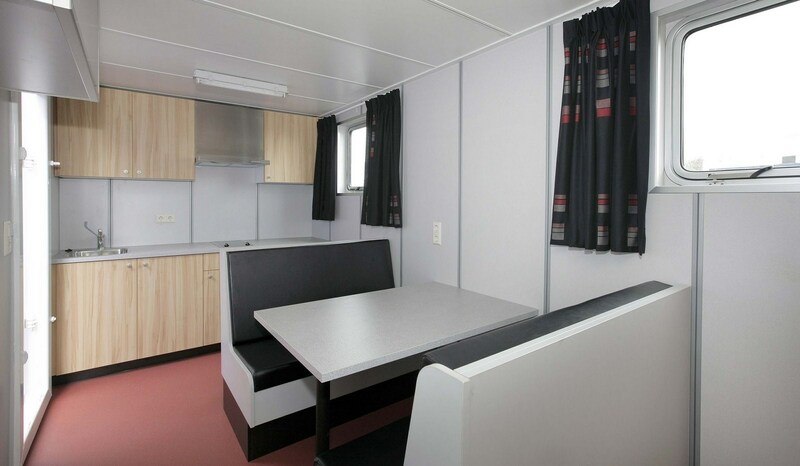 Accommodation containers include galley, bedroom and bathroom. 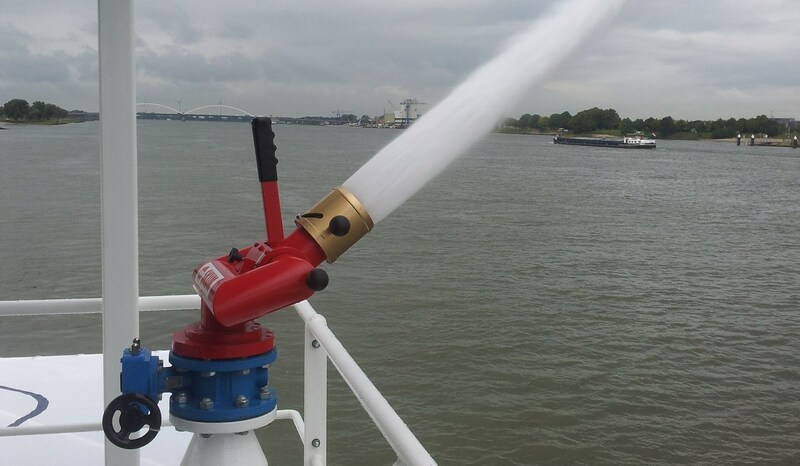 The vessels meet all the latest safety requirements, and we can provide fire fighting. The wheelhouse has an unobstructed all-round view, and can be equipped with the latest controls, navigation and communication equipment. 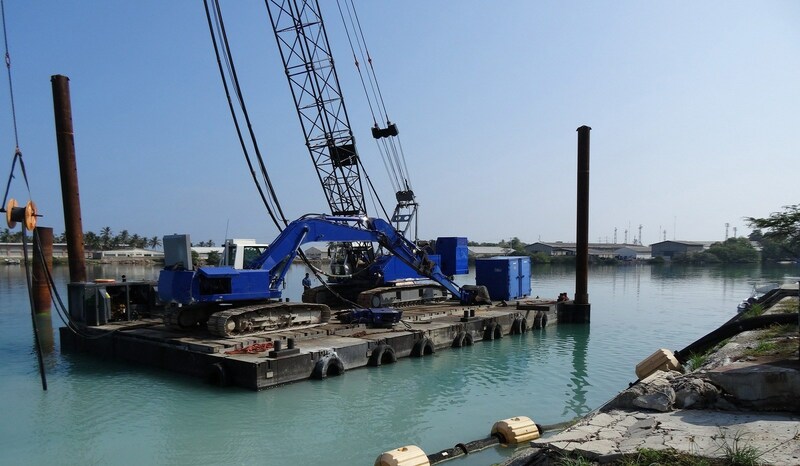 All kinds of heavy equipment can be delivered for Modular Pontoons including crawler cranes, excavators, crane mats, power packs, DOP pumps, hydraulic hammers, modular spud systems and heavy winches. Damen Modular Vessels can be equipped with heavy duty push bow, bow rollers, wooden work deck, heavy duty marine cranes and other equipment. The efficient wheelhouse layout offers an unobstructed view in all directions. Damen Modular Vessels are equipped to meet all the required safety provisions. 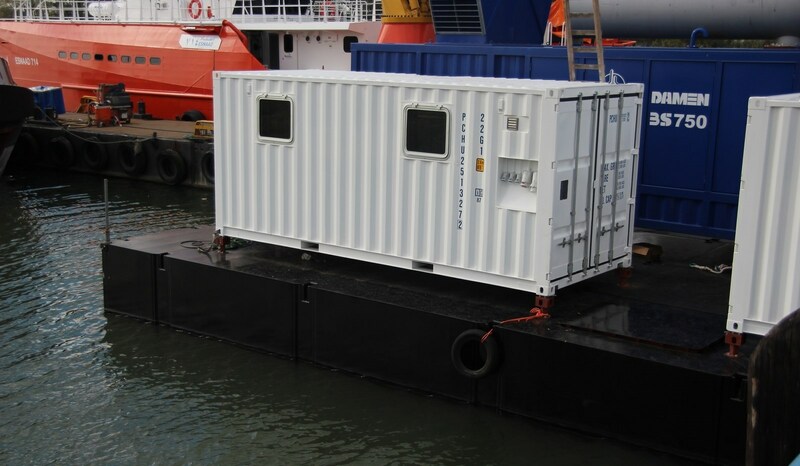 All Damen Modular Pontoons/Vessels can be equipped with mobile accommodation containers including galley, bedroom, bathroom, etc. The Damen Mobile Galley can be equipped to meet customer needs. 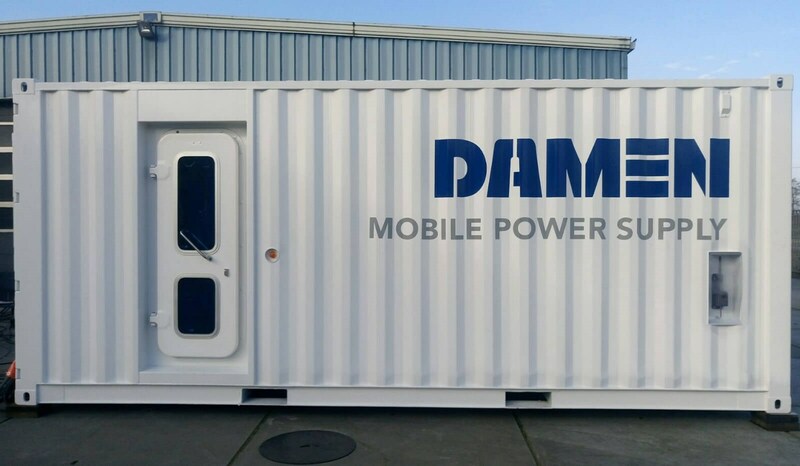 Electrical Power can be provided in remote areas by a Damen Mobile Power Supply. 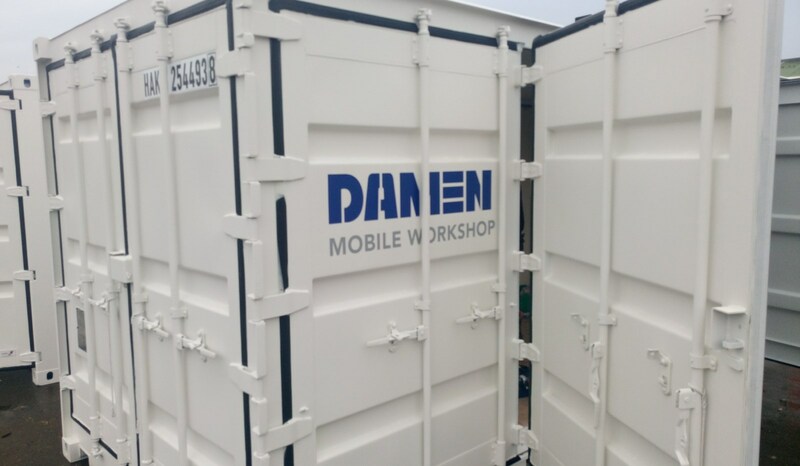 The Damen Mobile Workshop can be transported to any desired location. 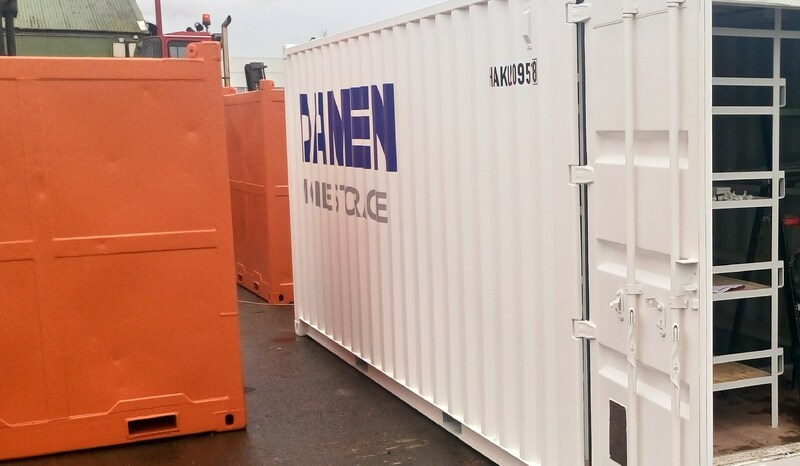 Damen Mobile Storage units can be delivered to any customer location. 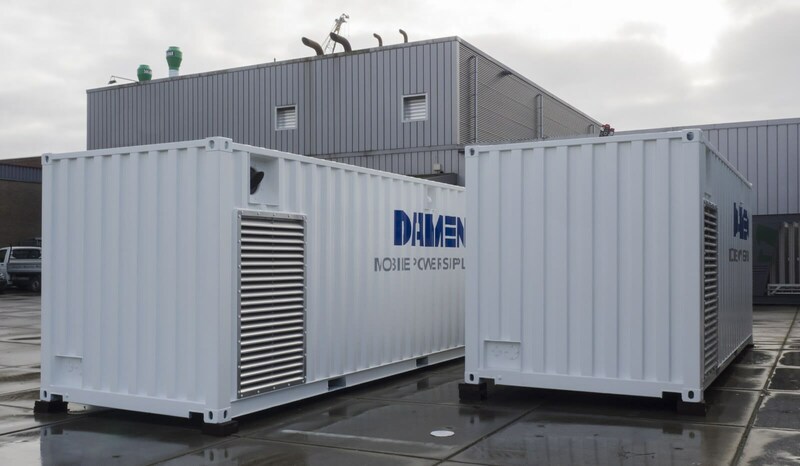 Damen Modular Constructions can be powered by a custom-made generator set. Modern Fire Fighting Equipment can be installed on all Damen Modular Constructions. 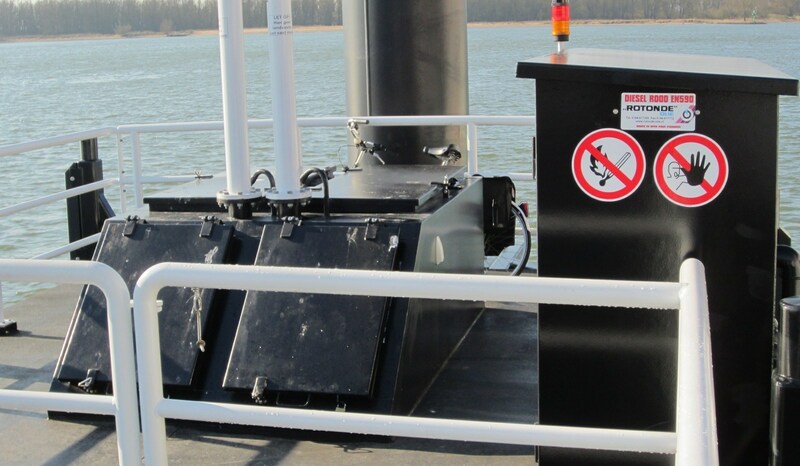 A Bunker station can be installed on a Modular Jetty for oil and fuel transfer. Heavy duty towing brackets can be provided. 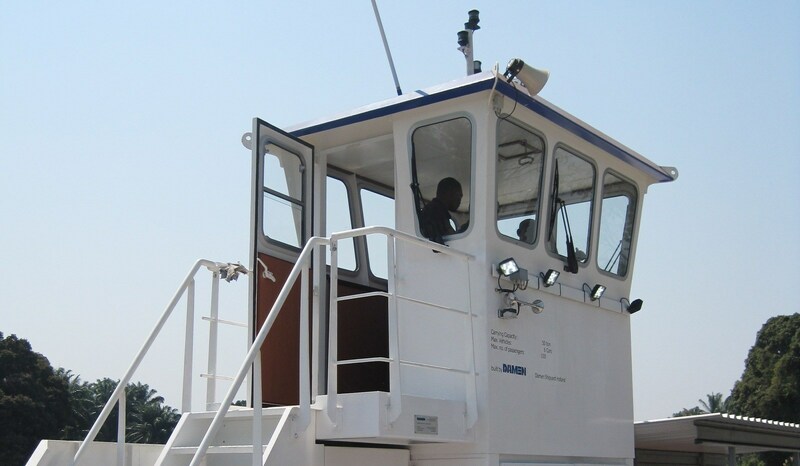 Damen-designed hydraulic winches are available for heavy duty operations. Filling stations can be provided to international standards and class regulations. 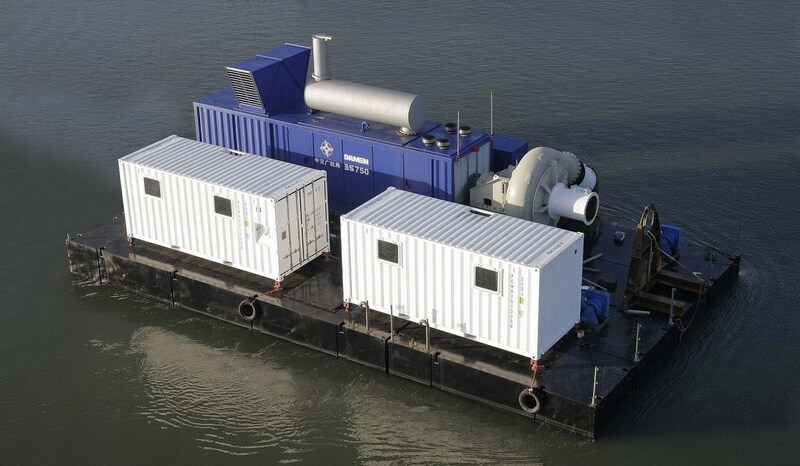 Damen can provide all types of modular fendering for safe berthing. 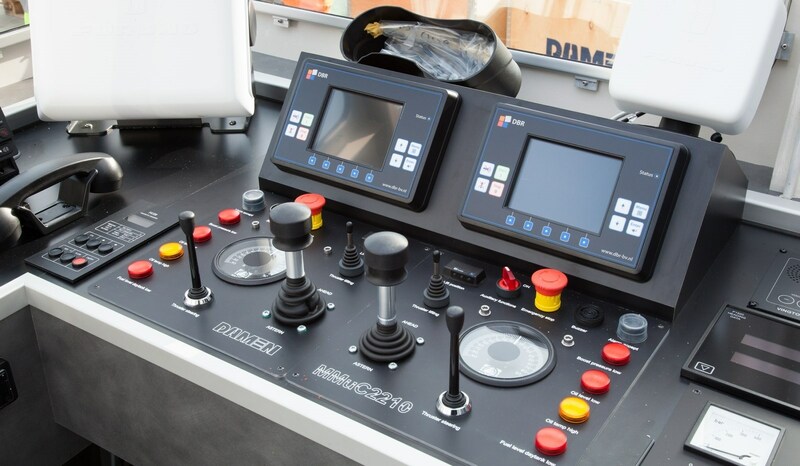 Damen Modular Vessels can be equipped with the latest controls. 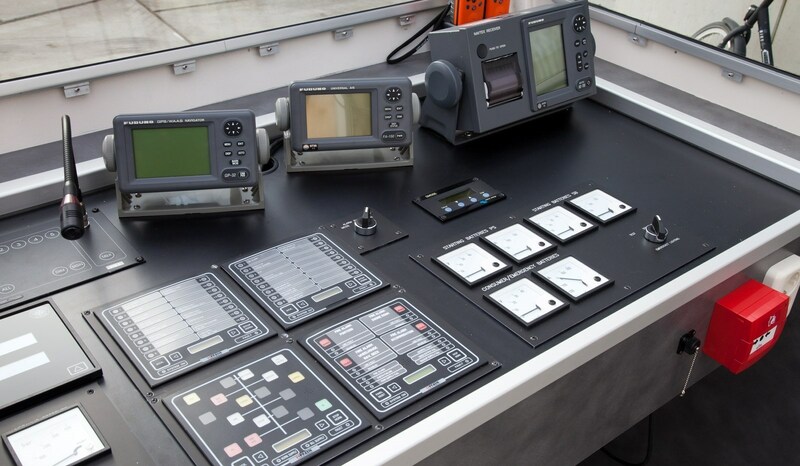 Damen Modular Vessels can have advanced navigation and communication equipment.